Call Chip, 805.501.9900 to see this amazing home. 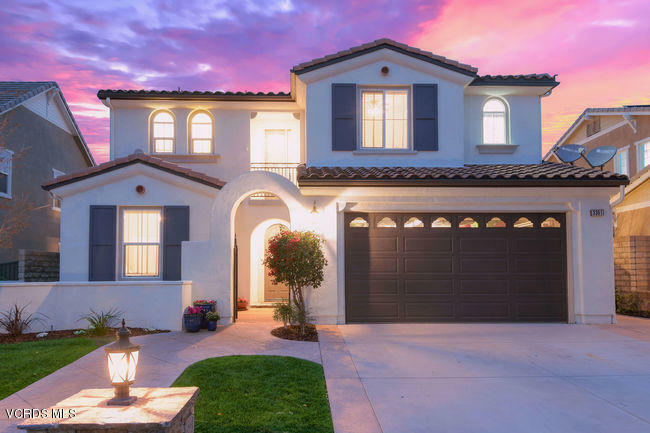 Welcome to Simi Valley Big Sky!This lovely 4 bedroom home with over 2, 900 sq ft of living space, is located in the foothills of the Big Sky community. As you walk in, you'll notice the immaculate condition and gorgeous hardwood floors. This home features a formal dining room, formal living room with french doors, eat-in chef's kitchen with granite counters, stainless steel appliances, walk-in pantry & large island open to the family room. Familyroom has a built-in entertainment center and fireplace. Bedroom with full bath and Den/playroom or possible 5th bedroom on 1st level. Master suite with large walk-in closet, master bath featuring marble counters, soaking tub & large shower. 2 bedrooms, bathroom & laundry room complete the 2nd level. Throughout this home you will find wood blinds, dual pane windows, large baseboards, ceiling fans & recessed lighting in most rooms and wired for alarm system. Entertainers backyard featuring Pool& Spa, lighted & covered patio and built-in BBQ bar with refrigerator & beer tap. Home has recently been painted inside & out. Enjoy living the Big Sky lifestyle with surrounding rolling hills, hiking trails, dog park, community park & close to shops, restaurants & freeway.